They [propaganda postcards] are not merely snapshots of a world at war. They are virtual windows into the minds and hearts of the millions who fought that war J. Kasonovich and P. Hageman, Propaganda Postcards of the Great War. Within the Museum of the Riverina's war collection, there are few documentary artifacts which provide the above-mentioned window into the mind and heart of the soldier. This postcard sent to Miss Ethel Mary Smith in the opening stages of the war is both a provocative and poignant memento. It is a bold and physical expression of the writer's fears, emotions and his acceptance of wartime conditions, evident in his statement "its duty first in this game." 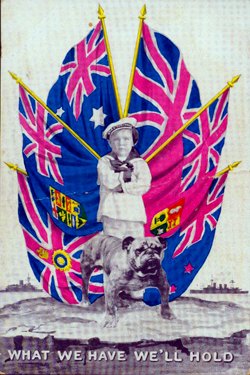 Patriotic cards are not necessarily rare within museum collections. The inherent value of this example lies in the inscription on the verso. The author of the card we know only as 'Billy'. In such anonymity, he can be seen to represent the unidentified, faceless mass of soldiers who fought in the Great War. After the war, many of these men and women returned to their pre-war lives and have been largely forgotten except by family members. This postcard is of historic significance as it allows the reader an insight into the very private feelings of a young, inexperienced soldier, who may have been away from his home, family and friends for the first time in his life. Although the First World War was fought on the other side of the world, it had a dramatic impact on the people of Wagga. 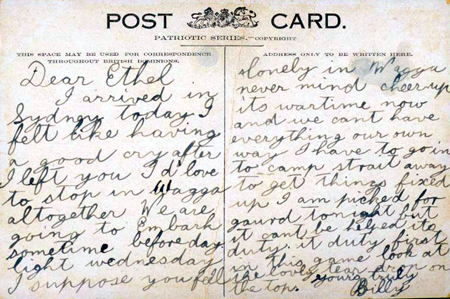 Billy's postcard reveals the effect of wartime on both soldiers and those loved ones they left at home.